Pagination is a feature that is used to restrict the display of the data that is not too long and neater. As seen in the illustration on the front of this article. Use pagination commonly used to display large amounts of data, so it can be separated / selected how the data will be shown first. 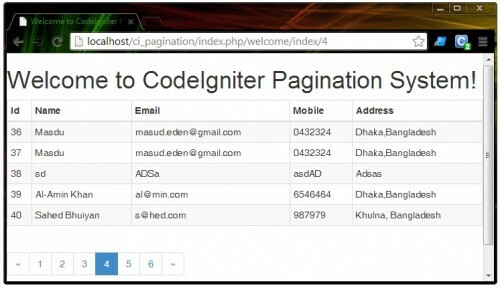 For those who use the CodeIgniter framework, it is not too difficult to apply the existing library in CodeIgniter pagination, the way was clear enough what when viewed on an existing local user. Enter database name “student” in create new database field. how can we make edit and delete, why you make it genertae 🙁 ! Excellent!! code. anybody use this code. The url for download is broked. Excellent. I wish I could buy you your favorite drink. But only I cannot because am not with you. So I say, “THANK YOU SO VERY MUCH”. Thanks for that. Good work!